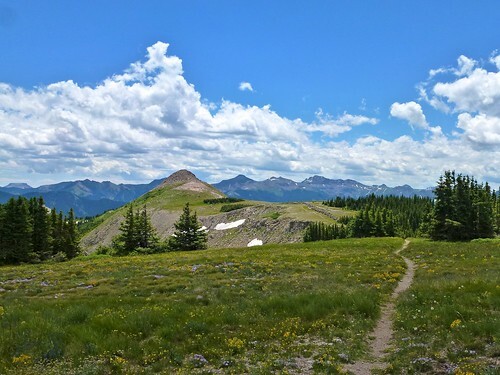 I slept in and had breakfast at my Pagosa Springs hotel at 9:00 a.m. and then drove 27 miles northeast to Wolf Creek Pass for a high-altitude hike before I headed to Durango for the next phase of my July vacation in New Mexico and Colorado. I first came through the pass, which has an altitude of 10,857 feet, last summer. I pulled in at the trailhead for the Continental Divide Trail (CDT) at 10:15 a.m. This trail extends 3,100 miles from Mexico to Canada along the mountains separating the Pacific and Atlantic Ocean drainage basins for the lower 48 states. My hiking trail book mentioned crossing the highway to take the CDT northward up to the antennas at Mount Lobo, which I drove up to last year. But I’d already seen that view and wanted something different. So I took the trail southward toward the Wolf Creek Ski Area. The trail led up through the lodgepole pine forest, sadly being destroyed by the pine beetle. I climbed steadily, for this section of trail would rise 1,000 feet before finally leveling off on a high ridge around the Ski Area. The mountains loomed into view and I admired little flowers called chiming bells. Then I had the blessing I was hoping for on this hike: snow on the trail. There’s nothing like hiking in late July and having just a touch of snow by the trail, especially when poor Bartlesville is sweltering at over 100 degrees every afternoon. It was lapping over the edge of a trail switchback next to a rubble field. From there I could zoom at full power on my camera and see the Mount Lobo antennas across the pass. I was now just above the Ski Area’s Raven’s Nest buildings and posed amidst the wildflowers growing amidst the rocky outcrops and took another shot standing on some convenient slabs. The view was incredible, but there was better to come. I encountered an immense rubble field, with columbine and other wildflowers growing in the cracks. I couldn’t resist posing yet again. I passed the Bonanza Chairlift and, having no trail map to guide me as to what to expect, wondered if I should turn around. Luckily a couple came down the trail and asked if I’d been on it before. They told me that ahead were some fantastic views and wildflowers and I could even climb Alberta Peak if I didn’t mind some rock-hopping. That was more than enough to spur me onward, and thus Treasure Mountain hove into view and then I came to a long ridge of wildflowers, complete with butterflies. The panorama was great, and even better when I walked far enough for Treasure Mountain to return to view. I did not know it was Treasure Mountain at the time, and wondered if it were the Alberta Peak the hikers had mentioned, but there was no clear way to get over there safely. The trail then crossed over the ridge and I saw an immense panorama of the land beyond the Ski Area slopes, and I immediately spotted a big mound of rock which I knew must be Alberta Peak. Down below was what I would later learn to call Alberta Peak Reservoir – that’s a bit convenient, I know. This hillside was also strewn with wildflowers and the exposed outcroppings were piles of stone. The trail paralleled snow fences toward Alberta Peak, but there was no trail up it. So I bushwhacked, although there were no bushes, only a few Columbine. Alberta Peak was covered in a huge jumble of small boulders and slabs of stone, making footing treacherous, especially when a large stone would shift under my weight. I was very glad I had my trekking poles and I still managed to fall over once. The summit had a shallow depression and out on the end I could see the ridge heading on eastward. I had climbed to 11,780 feet according to my GPS tracker, although the web says Alberta Peak is up at 11,854 feet. Either way, I was up high enough for altitude sickness to kick in despite my having been near 8,000 feet high in Pagosa Springs for several days. A headache would start up when I began my descent and would not fully subside until I reached Durango. I kept sucking water from my new hydration pack, which I found to be better and worse than carrying water bottles in my former little pack, which I tossed when it ripped apart from too much age and stress. The new pack rides better on my back, and I like not having to buy bottled water and dispose of the bottles after a hike. And by putting my filled water pack in a hotel refrigerator overnight, I can have fairly chilly water for several hours on the trail. What I don’t like is the plastic taste from sucking on the tube and how the water starts out warm, having sat in the tube running down my side and under my arm, and only after a swig or two cools down as it has come out of the insulated pack. But I’ll keep using it. I sat down for a snack lunch. Flies were trying to snack too, and a cute little chipmunk scampered about, as did a ground squirrel. My headache then struck and I knew I had to drink water and descend as rapidly as was practical. So I set off for the trailhead, passing a fellow on the wildflower ridge who asked me the same question I’d pondered earlier: was there more to see? I encouraged him to cross the ridge to see the other side and Alberta Peak, and the more I described the bigger he grinned until he strode off for his own adventure. I reached the trailhead, having hiked 5.75 miles in four hours, climbing upward a total of 1,257 feet during the hike with a maximum gradient of 15%. And I’m marking this one down as another favorite day hike, despite the headache from the altitude. The lady I hiked with at Piedra River mentioned using motion sickness patches to help alleviate altitude sickness – I will try that if I ever tackle something formidable like a fourteener (peaks above 14,000 feet). It was after 2 p.m. when I returned to the car, so I drove into Pagosa Springs for a Payday and a drink and then headed on to Durango, where I checked into a hotel that is notably worse than the one I had in Pagosa Springs yet costs $40 more per day. Location, location, location. I showered and with my headache gone I opted to not overeat for once on this trip. TripAdvisor said Home Slice Pizza was good, so I drove downtown and discovered it was a tiny hot place with almost no parking or seating. But they had slices on display ready to be heated up in a big rotating oven. I picked out a slice of mushroom and had it at one of the few tables lined up against a long bench. It was delicious! Then I drove over to scope out the Durango Arts Center, where I’d be watching a local production of Greater Tuna later in the evening. I really wanted to look at the parking situation, which was as horrible as I expected. Durango has only a few tiny parking lots and hundreds of on-street spaces. Thankfully after 6 p.m. one can ignore the meters. So I returned to the hotel to start editing photos and then headed back out with plenty of time to locate a parking spot downtown. I passed a statue of Puck by Elizabeth MacQueen and a building mural near the art center. I had time to stroll around and spot the 1892 Newman building, a Romanesque sandstone building which started out as the Smelter National Bank. I also found the 1887 Strater Hotel, which has a melodrama show I hope to catch tomorrow night. As I walked to the 1898 General Palmer Hotel, I heard the whistles of the steam train arriving from Silverton, managing to capture it on my iPhone, and saw it rolling toward the depot. At the art center, I found the small theater set up with chairs and tables. I purchased some popcorn and a Coke and noticed the OKKK radio station booth ready to be manned. Greater Tuna makes a lot of use of radio programs and the play was co-written by Joe Sears, who was born and raised in Bartlesville. He and his partner Jaston Williams have performed the play countless times, between them playing 20 characters, both male and female. I’d heard about it but never seen Greater Tuna, and enjoyed this Durango performance by Coloradans Miles Batchelder and Geoff Johnson. It was fun hearing the place names of Hogshooter, Dewey, and Coweta being used in the play, all of which are actually towns in northeast Oklahoma, with Hogshooter and Dewey being Bartlesville’s neighboring communities to the east and north. I wound up sitting next to Terry Swan, the director of the play and president of the arts center, as well as his wife, Dinah, who did the lighting and set design. They were both very gracious and seemed to enjoy that I was from Bartlesville. Dinah tipped me off to the Bar D Chuckwagon Supper Show held nightly north of town, and I’ve booked a reservation for my final night here. Tomorrow I drive the San Juan Skyway scenic drive up to Silverton, over to Telluride, and so forth. I don’t know how much, if any, hiking I’ll do.